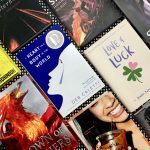 It’s that time of year again, friends–BookCon is almost here! Here’s a comprehensive schedule of all our Riveted by Simon Teen activity this year (you can find a graphic version to download here). 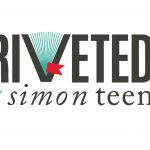 Don’t forget to follow us @SimonTeen and the hashtag #getriveted on Twitter for up-to-the minute news and content from our authors at BookCon. See you soon! Show floor opens 10:00 a.m.
Attendees will receive a deluxe tote bag, enamel pin, and a Queen of Air and Darkness chapter sampler when they sign up for the Shadowhunter Army newsletter (while supplies last). The first 60 attendees will receive a Magnus Bane plush. Play carnival games to win ARCs, swag, and raffle tickets! Come meet Mary H.K. Choi and Sandhya Menon and get an iced coffee to perk you up! From Twinkle, With Love and When Dimple Met Rishi will be available for purchase in booth. Ticketed signing. Visit the Book Con website to get tickets. Ticketed signing, purchase of Scythe or Thunderhead required. Visit the Book Con website to get tickets. 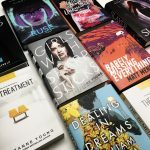 Kiersten White will be signing samplers of Slayer (Spring 2019). Come meet Morgan Matson, Jenny Han and Siobhan Vivian and get a sweet treat! Cassandra Clare, Veronica Roth, Brandon Sanderson, Tomi Adeyemi and Marissa Meyer. Jason Reynolds, Jacqueline Woodson, Angie Thomas, and DeRay Mckesson. Morgan Matson, Siobhan Vivian, Colleen Hoover, Mary H.K. Choi, and Kami Garcia. Ticketed signing, purchase of Lady Midnight or Lord of Shadows, or a pre-order of Queen of Air and Darkness required. Queen of Air and Darkness chapter samplers available for giveaway at signing. Visit the Book Con website to get tickets. Ticketed signing, purchase of Long Way Down, Sunny, For Every One, or All American Boys required. Visit the Book Con website to get tickets. Ticketed signing, purchase of Save the Date required. Visit the Book Con website to get tickets. Ticketed signing, purchase of Stay Sweet required. Visit the Book Con website to get tickets. Ticketed signing, purchase of Emergency Contact required. Visit the Book Con website to get tickets. 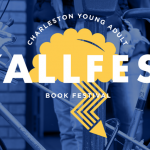 Show floor closes 6:00 p.m.
10:45 a.m. – 11:45 a.m. PANEL – Middle Grade Blowout! Rachel Renee Russell, John August, Zach King, Daniel Jose Older, and Soman Chainani (moderator). Ticketed signing, finished copy giveaway of Trail of Lightning. Visit the Book Con website to get tickets. Ticketed signing, purchase of To All the Boys I’ve Loved Before, P.S. I Still Love You, or Always and Forever, Lara Jean required. Visit the Book Con website to get tickets. Jason Reynolds, Brendan Kiely, Kody Keplinger, and Stephanie Garber. Jenny Han, Nicola Yoon, Alexandra Bracken, and David Levithan. Ticketed signing, purchase of Tradition or All American Boys required. Visit the Book Con website to get tickets. Show floor closes at 5:00 p.m. So that’s what we’re up to @ BookCon this year! Will we see you there?